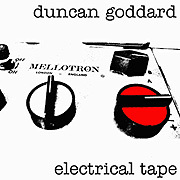 Duncan Goddard, the cyborg-like middleman for Radio Massacre International, has released a solo album called Electrical Tape (60'00") - a work realized (almost) entirely using a vintage tape replay instrument called the Mellotron. Electrical Tape presents six pieces of varying length featuring the classic flute, strings, choir and other heavily processed ethereal sounds associated with this device, and sounds as fresh and true as it did in the 1970s Prog-Rock and Spacemusic that made it famous. Goddard is the perfect curator of the notoriously temperamental Mellotron. Its sounds and music seem to have magnetized him, who so loves all the shortcomings and distortions engineered out of this keyboard's future generations. From expressions of nothingness and dark space to the weirdly beautiful Electrical Tape achieves an uncanny haunting intensity. Its intellectual minor key montage of fuzzy, kicky energetic pulsing will send listeners to deep space while gentle descending figures accentuated by tremulous strings and murky drones portray a nocturnal and fatal illumination. His precisely executed abstractions seem felt rather than reason out. Resilient to conclusions Goddard's work asks, what is authentic? - to a generation that is no longer sure that there is such a thing. Electrical Tape creates a dialogue between the old and the new, and says more about the man than it does the machine.